"OMSI to me is a place that inspires learning. I see OMSI as a catalyst, a convener, and as a place for all ages to come together to share learning about science and technology." This is something often expressed by Penny Serrurier, OMSI's Secretary of the Board of Trustees, a volunteer position that she has held for four years. As a frequent visitor to OMSI, Penny remembers playing with her two boys in Science Playground. She heard only good things about OMSI, our president, Nancy Stueber, and the entrepreneurial spirit of the museum that she felt so compelled to join the Board of Trustees, volunteering her time on both the executive and development committees. Coming from a family of active community members, it has been ingrained in her that service for a greater good is one of the most important things that you can do. As she became more deeply connected to OMSI's mission and vision, she looked for additional ways to support OMSI. It was a natural step for Penny to volunteer as a Trustee. "It's really satisfying that after my lifetime the good work will continue on. If I can make a contribution that will help sustain the efforts and impact that OMSI is making to better our community, I am happy to do that." Penny believes that by making a provision for OMSI in her estate plan will not only help keep OMSI financially stable to ensure that hands-on science learning is possible. It will also inspire others to join her in the J.C. Stevens Legacy Society. The legacy society, named after OMSI's visionary founder, recognizes donors who have included OMSI in their estate plans. 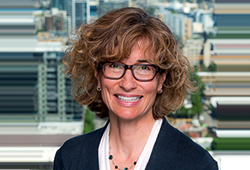 When not volunteering at OMSI, Penny is practicing law in the areas of tax-exempt organizations, charitable giving, estate planning and administration, business succession planning, and personal tax planning. She loves spending time with her family, running, and reading for her book club. This spring she is looking forward to seeing her eldest son graduate high school. We would like to recognize Penny Serrurier as a new member to the J.C. Legacy Society and thank her for her continued support. To learn more about how you can become a member of the J.C. Stevens Legacy Society, please contact Catherine Ingvaldsen at (503) 797-4571 or cingvaldsen@omsi.edu.